Sharapova said she was "looking forward" to playing Williams and "disappointed" the American had to withdraw. "I wish her a speedy recovery and hope she returns to the tour soon," she added. The pair have had a frosty relationship since they first met on court in 2003, although Williams said in her pre-match news conference on Saturday that she did not have any "negative feelings" towards the Russian. There has not been much of a rivalry on court in recent years, Williams having won 19 of their 21 meetings. Both of Sharapova's wins came in 2004 - including that year's Wimbledon final. 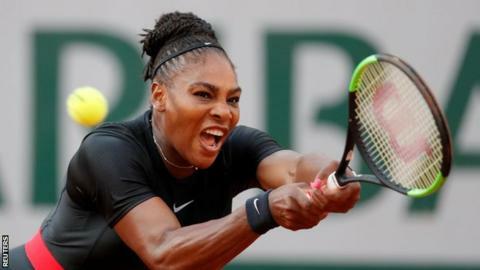 Williams had been in astoundingly good form in the first week, but footage of the final set of Sunday's doubles - which she and sister Venus lost 6-0 - showed Serena rolling in a number of slow first serves. The three-time champion chose to play doubles as well as singles because she knew she needed matches under her belt. But six matches in six days - after just four in the previous 16 months - appears to have taken its toll. A pectoral injury is most commonly associated with overuse. Tuesday's MRI scan will reveal more, but if there is no serious damage, then Wimbledon may still be very much within Williams' sights. There are still four weeks to go, and not being able to play a grass-court warm-up event beforehand should not be a concern: only twice in her career has she done so.